There isn’t much you can’t do in the kitchen with mason jars. I mean seriously. From oatmeal, to smoothies, to salads, to totally unique lunch ideas that will make you the envy of your hungry coworkers, and even just storing leftovers. Mason jars do it all. Over the weekend, I was craving some comfort food like whoa. Let me clarify. I wanted to chill out and watch the Texans-Patriots game with something hot and delicious. Since Ryan Tongia was unavailable, I decided I’d make some cornbread instead. Such is life. A while back I saw this recipe for baked chili and cornbread, and I really wanted to see what that’s all about. I’ve been a bit hesitant, because the recipe called for baking in a mason jar. Now I’ve made a lot of things with the help of mason jars, but the scientist in me is always a little bit nervous when putting non-Pyrex glass in the oven. If you’re anything like that, believe me, I completely understand. There are tons of oven baked mason jar recipes floating around the internet, though, so I’m pretty sure I’ve just been paranoid. Nonetheless, I’ve mostly avoided baking in mason jars, but this weekend three things came into play. First, this sudden craving for Fall season comfort food. Second, the bottomless pit of weekend lazy that I slip further into as the minutes go by, fueled by my couch, a chunky throw, and NFL Sunday Ticket rendering me almost completely incapable of preparing a well thought out meal. Last, but certainly not least, is my insatiable desire to prepare cute little meals that are Instagram worthy and mason jars are perfect for that (admittedly, most of the time they end up looking like Cooking For Bae). So basically, my lazy and my shallow gave me the courage to make this recipe. 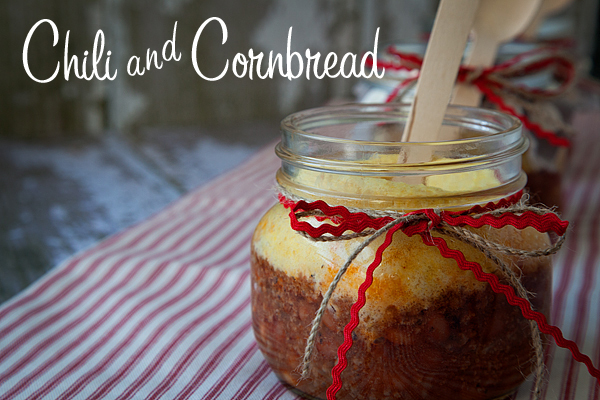 I present you with… Mason Jar Chili and Cornbread!!! You must try this! If you’re not as lazy as me and want to try your hand at homemade chili and homemade cornbread, try these recipes. Just replace the meat in the recipe with tofu or quinoa to keep it vegetarian. ***For a variation, you can try biscuit batter or pie dough over a hearty stew for a mason jar mini pot pie!